You’ve probably heard the recent news about a study focusing on the Mediterranean diet, published in the New England Journal of Medicine. It basically confirmed what doctors had suspected for years: Eating the foods popular in Mediterranean countries such as Greece and Italy can help people at high risk of heart disease avoid strokes, heart attacks and even death. The Mediterranean diet — often referred to as the “heart-healthy diet” — is known to reduce the risk of heart disease by lowering levels of LDL cholesterol, or the “bad” cholesterol that’s more likely to build up deposits in your arteries, says Keri Glassman, MS, RD, CDN, founder and president of Nutritious Life and author of The New You and Improved Diet, notes that . Studies show that a Mediterranean-type diet is advantageous across the board for cardiovascular risk factors, including total cholesterol, LDL cholesterol, HDL cholesterol, triglycerides, blood pressure and blood sugar levels. More than that, “it incorporates the basics of healthy eating, with a focus on small portions of high-quality foods that are fresh, seasonal and local,” says Glassman. The Mediterranean plan is much more than just a diet, she adds; it’s an overall approach to healthy living that emphasizes getting plenty of exercise and enjoying meals with family and friends. Even if your heart is healthy, you and your family can still benefit from eating the foods typical of Mediterranean cuisine. Among them: olive oil; nuts; oily fish like salmon and mackerel (all rich in omega-3 fatty acids); garlic (which can lower blood pressure); herbs and spices such as cinnamon and rosemary; and legumes like peas and beans (rich in protein and fiber). These recipes from Glassman will help introduce your family to the benefits of Mediterranean eating. Each makes one serving, so increase the ingredients accordingly for delicious meals that will be popular with everyone. This recipe is a fun meal to make together. Line up the ingredients as you would with tacos, and let everyone fill up their own pita! 1. Combine the lemon juice, oil, and garlic in a small bowl. Transfer the mixture to a zipper-lock bag and add the shrimp, tossing to coat. Refrigerate 15 minutes. 2. Coat a nonstick grill pan with olive oil cooking spray. Preheat over medium-high heat. Toss the arugula and tomatoes in a small bowl. 3. Remove the shrimp from the marinade. Sprinkle the basil and parsley on both sides and season with salt and freshly ground black pepper. 4. Cook 2 minutes per side, or until opaque throughout, flipping halfway through. Let cool 1 to 2 minutes and cut into 1/2″ pieces. 5. Spread the hummus inside the pita. Fill with the arugula-tomato mixture, then add the shrimp. 1. Heat oil in a large saucepan over medium heat. Add carrot, broccoli, onion, mushrooms, peas, garlic, thyme, salt and pepper and cook, stirring, until the vegetables release some of their juices, about 3 to 5 minutes. Increase heat to medium-high and continue to cook, stirring often, until most of the liquid has evaporated. 2. Add broth, water and white beans; bring to a boil, stirring often. 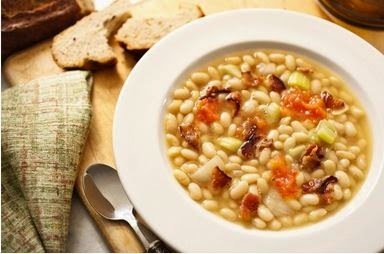 Reduce heat to a simmer and cook, stirring occasionally, until the vegetables and beans are tender. 3. Remove from heat, add walnuts and serve. By Laura Carson Miller for Life & Beauty Weekly, Laura Carson Miller is an Atlanta-based freelance writer specializing in lifestyle issues. Her work has appeared in such magazines as Simply the Best, New Beauty and Atlanta Weddings, as well as online at SheKnows, Fitness Republic and Nomad-Chic.